WASHINGTON -- President Barack Obama killed a Canadian energy giant's application to build the Keystone XL pipeline on Friday, declaring the proposed project wouldn't serve U.S. national interests and would have undercut America's global leadership on climate change. The decision capped a seven-year saga that spiraled into one of the biggest environmental flashpoints of Obama's presidency. Announcing his decision at the White House, Obama said he agreed with Secretary of State John Kerry, whose department formally rejected the proposal for a 1,179-mile pipeline crossing the nation's heartland. He downplayed the claimed economic benefits of the pipeline, arguing it wouldn't have lowered U.S. gas prices, contributed to U.S. jobs long-term or made the nation less dependent on foreign energy. Pres. Obama: Keystone XL wouldn't make meaningful contribution to economy, wouldn't lower gas prices, wouldn't increase energy security. "This pipeline would neither be a silver bullet for the economy, as was promised by some, nor the express lane to climate disaster proclaimed by others," Obama said at the White House. Killing the pipeline allows Obama to claim aggressive action on the environment, potentially strengthening his hand as world leaders prepare to finalize a major global climate pact. Obama used the occasion to announce his plans to travel to Paris in the coming weeks for talks on that agreement, which Obama hopes will be a crowning jewel for his environmental legacy. Pres. #Obama says #KeystoneXL pipeline won't lower gas prices for consumers. It also won't secure America's energy needs. The president, flanked by Kerry and Vice President Joe Biden, said the U.S. had become a global leader on climate action in the run-up to the Paris meeting. "Frankly, approving this project would have undercut that global leadership - and that is the biggest risk that we face: not acting," he said. Yet the decision puts the president in a direct confrontation with Republicans and energy advocates that will almost surely spill over into the 2016 presidential election. It could also damage U.S. relations with Canada - a possibility that Obama acknowledged. The president said he'd spoken to new Prime Minister Pierre Trudeau, who had "expressed his disappointment" over the decision. In a nod to the political fight that developed over his many years of delay, Obama project had taken on an "overinflated role" in U.S. political discourse. "It became a symbol too often used as a campaign cudgel by both parties rather than a serious policy matter," Obama said, without acknowledging his own role in allowing the controversy to drag out over several national elections. Keystone has been in limbo for more than 7 years, awaiting a series of U.S. reviews that have lasted more than 5 times longer than average, according to a recent Associated Press analysis. The pipeline requires a presidential permit to cross the U.S.-Canadian border. Over time, the pipeline took on symbolic value of epic proportions, elevated by environmentalists and energy advocates alike into a proxy battle for climate change. Environmental groups hailed Obama's decision, with some declaring Friday "a day of celebration." "Stopping the Keystone XL pipeline is a victory for the planet, for the health and well-being of the communities along the pipeline route," said Sierra Club Executive Director Michael Brune. Yet while the project is dead for now, Obama's rejection will likely not be the last word for Keystone XL. Backers are expected to challenge his decision in court, and the Republican-controlled Congress may try to override the president, although those efforts have previously failed. The project could also get a fresh look in 2017 if a Republican wins the White House and invites TransCanada to reapply. "Given this project's importance to North American energy independence, the question still remains not if but when Keystone will be built," said Senate Majority Leader Mitch McConnell, R-Ky.
Another open question is whether TransCanada will try to recoup the more than $2 billion it says it has already spent on the project's development. Earlier in the year, the company left the door open to suing the U.S. government. TransCanada, an Alberta-based company with an expansive North American footprint, first applied for Keystone permits in September 2008 - shortly before Obama was elected. As envisioned, Keystone would snake from Canada's tar sands through Montana, South Dakota and Nebraska, then connect with existing pipelines to carry more than 800,000 barrels of crude oil a day to specialized refineries along the Texas Gulf Coast. Democrats and environmental groups latched onto Keystone as emblematic of the type of dirty fossil fuels that must be phased out. Opponents chained themselves to construction equipment and the White House fence in protest. But Republicans, Canadian politicians and the energy industry touted what they said were profound economic benefits - thousands of jobs and billions injected into the economy. They argued transporting crude by pipeline was safer than alternatives like rail, and charged Obama with hypocrisy for complaining about the lack of infrastructure investment while obstructing an $8 billion project. The first major delay came in 2011, when Obama postponed a decision until after his re-election. He cited opposition to the proposed route through Nebraska's sensitive Sandhills region and said the U.S. would wait while the route was revised. When Congress passed legislation requiring a decision within 60 days, Obama rejected the application, but allowed TransCanada to re-apply. In a major speech unveiling his climate change agenda in 2013, Obama established a litmus test for Keystone: He wouldn't approve it if it were shown to significant increase carbon dioxide emissions. Yet although a U.S.-commissioned environmental review found Keystone unlikely to exacerbate emissions, that assessment was based on outdated, higher oil prices, so environmentalists insisted it be redone. 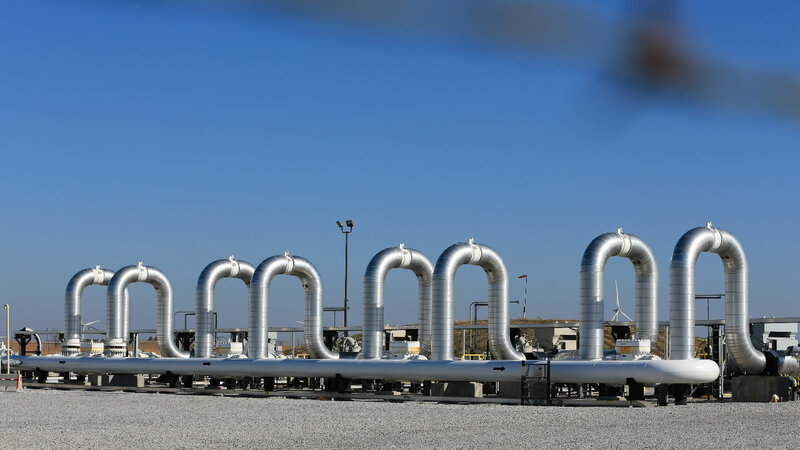 For TransCanada, the financial imperative to build Keystone may have fallen off recently amid a sharp drop in oil prices that could make extracting and transporting the product much less lucrative. But TransCanada's CEO has insisted that wasn't the case.